A golfer, playing a round by himself, is about to tee off, and a greasy little salesman runs up to him, and yells, "Wait! Before you tee off, I have something really amazing to show you!" The golfer, annoyed, says, "What is it?" "It's a special golf ball," says the salesman. "You can never lose it!" "Whattaya mean," scoffs the golfer, "you can never lose it? What if you hit it into the water?" "No problem," says the salesman. "It floats, and it detects where the shore is, and spins towards it." "Well, what if you hit it into the woods?" "Easy," says the salesman. "It emits a beeping sound, and you can find it with your eyes closed." "Okay," says the golfer, impressed. "But what if your round goes late and it gets dark?" 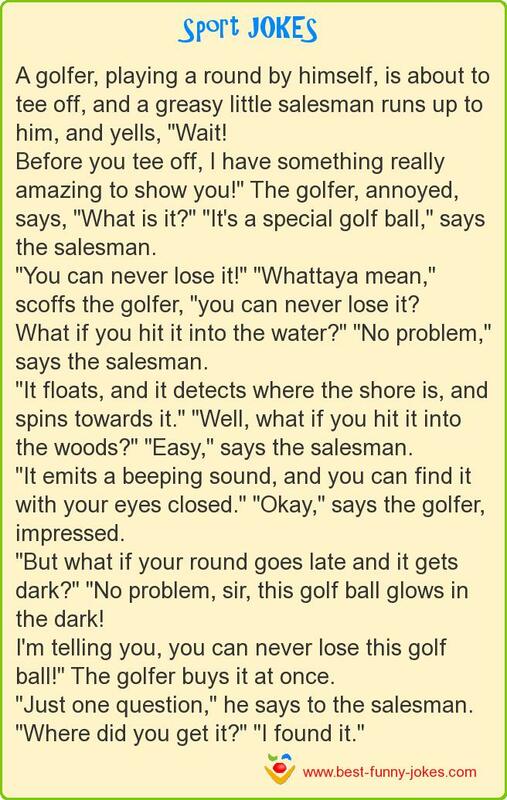 "No problem, sir, this golf ball glows in the dark! I'm telling you, you can never lose this golf ball!" The golfer buys it at once. "Just one question," he says to the salesman. "Where did you get it?" "I found it."